Recently I heard of a 12 Step Group closing its doors due to lack of support and attendance. Those few remaining members expressed a sincere saddness that the group was no longer. Other members in the fellowship commented that it was sad for them too, because it was the first group they attended when they came into the fellowship. Twelve Step Groups are dynamic entities–members come and go as the please, they relapse, move away, join other groups, pass away, or just stop coming to meetings altogether. There are other reasons for a Group to close it doors, perhaps it holds its meeting at a inconvenient time or day of the week or is located “off-the-beaten path”. These reasons should be considered when a Group notices its membership dwindling–prudent action is for a Group to take regular Group inventory. What more can the group do to carry the message? Considering the number of alcoholics or addicts in our community, are we reaching enough people? What has the group done lately to bring the 12 Step message to the attention of physicians, judges, members of the clergy, and others who can be helpful in reaching those who need help? Is the group attracting only a certain kind of alcoholic, or addict or are we getting a good cross section of our community? Do new members stick with us, or does turnover seem excessive? How effective is our sponsorship? How can it be improved? Has everything practical been done to provide an attractive meeting place? Has enough effort been made to explain to all members the need and value of kitchen and housekeeping work and other services to the group? Is adequate opportunity given to all members to speak and participate in other group activities? Are group officers picked with care and consideration on the basis that officership is a great responsibility and opportunity for Twelfth Step work? Does the group carry its fair share of the job of helping out at the Intergroup/Area? Do we give all members their fair chance of keeping informed about the whole of 12 Step Recovery, Unity, and Service? Another reason many Groups close their doors is because they have lost focus on Tradition Five: Each group has but one primary purpose — to carry its message to the alcoholic (addict) who still suffers. Furthermore, Tradition Five (Long): Each Alcoholics Anonymous group ought to be a spiritual entity having but one primary purpose–that of carrying its message to the alcoholic (addict) who still suffers. P.S. 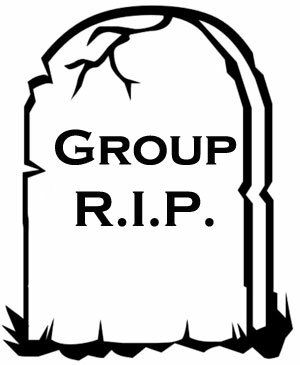 Dead Groups serve no one. Let us hear about your thoughts and reasons as to why Groups closed their doors forever. In the beginning it was Bill W. and Dr. Bob and then came Bill D.–A.A. Number three. Definition of a Cocaine Anonymous "Group": A meeting is when two or more people gather together to share their experience, strength and hope with each other. The meaning of anonymity “in all public media” is confusing. 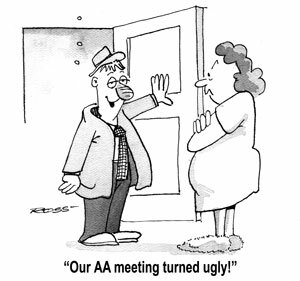 We can advertise our AA and OA meetings in the newspaper but there is zero visibility on social media. Anonymity, the way 12-step approaches it in this day and age, equals invisibility. There needs to be an organizational inventory done to assess how 12-step communicates its presence within communities. Good article. If people don’t go to meetings, the more difficult it is for a group to stay open. That is one of the reasons I go. AA and NA are dying here. No one will admit it but I go all over to meetings and see the same thing everywhere. I think it is Drug Court, but everyone says I’m wrong. Meetings get creepy when 90% of the people don’t want to be there and you are trying to bear your soul. It seems like most of the talk in meetings these days is arranging Drug Court people to get sober and drop their nasty habit. Kind of brow beating them. But I am not going anywhere. I gotta go to meetings. Just saying, its really in flux.